You’ve discovered that it has a few significant problems with it, right? Chances are the taper is noticeably irregular, the neck is as thick as a baseball bat, and you can’t get the nibs to loosen up despite knowing that they’re a left-handed thread because they were cranked on too tight at the factory. But here’s the good news: all of those issues are fixable. 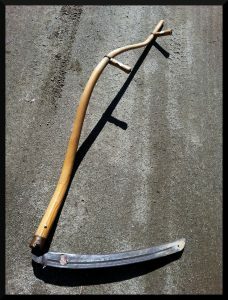 The irregular taper and thick neck of the snath can be fixed with a little time with a spoke shave and rasp, and the nibs can be loosened by using some rubber vise jaw pads to hold the grips of the nibs tightly without marring or cracking them and using the shaft of the snath for leverage to break them loose. 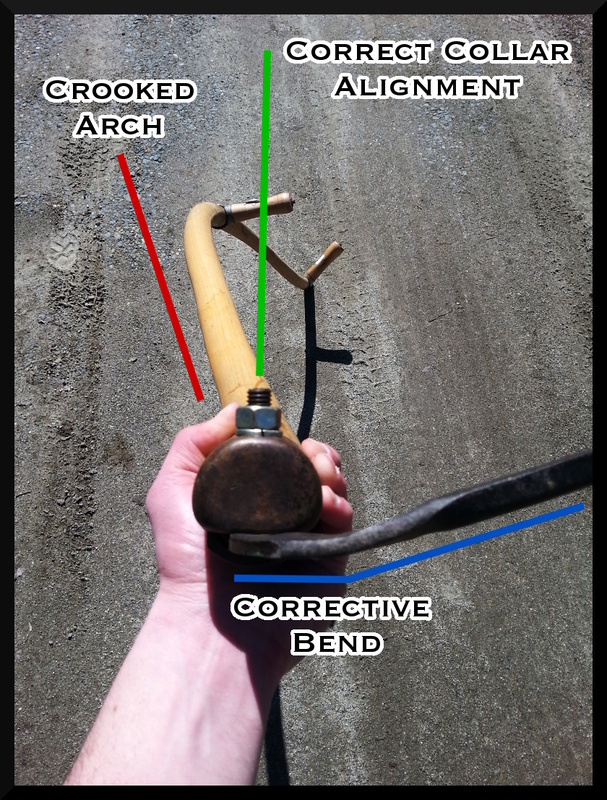 There’s one major flaw, however, that’s not as easy to correct…the collar is installed a whopping 20° out of alignment, and when the loop bolt is perpendicular to the ground like it should be, the arch of the snath is pointing right towards you. It’s not a perfect fix, but you can correct for this by introducing a twist to the tang of your blade much like is commonly seen on European pattern blades. 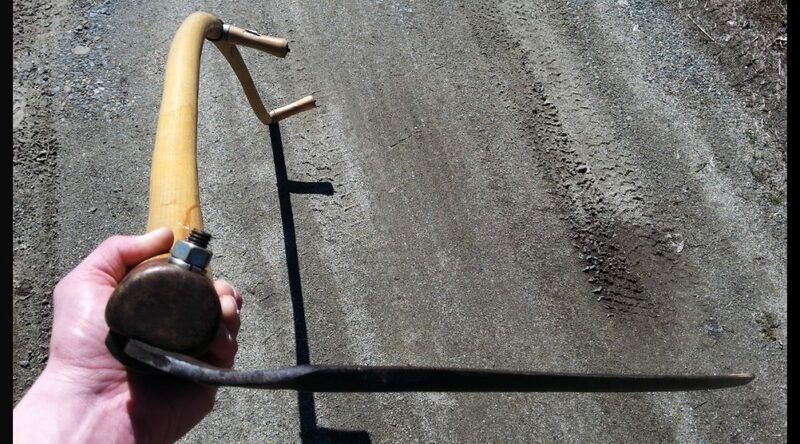 Heat the shank of the tang in same manner you would if you were adjusting its pitch, but instead, lock the tang in a sturdy vise and pull on the blade while the shank is still at heat to introduce a matching 20° twist to the tang. This will correct for the crooked collar to bring the arch of the snath back to vertical. The downside of this is that when adjusting the hang of your blade you’ll now be pivoting the length of the blade along a path that resembles an inverted cone instead of in a nice flat circle like you would with a snath that had the collar correctly mounted, but it’ll at least keep the arch from striking you in the thighs and knees every time you take a stroke with the scythe! A Seymour No.1 snath as currently assembled from the factory. The blade was bent to correct for the collar misalignment prior to the photo being taken. End view showing the misalignment of the snath’s arch when the collar runs parallel to the ground as intended. 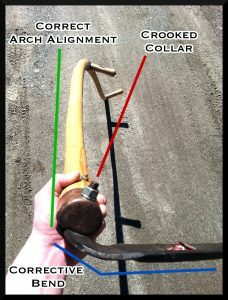 View showing how the corrective bend of the blade’s tang brings the arch of the snath back into correct alignment despite the crooked collar. 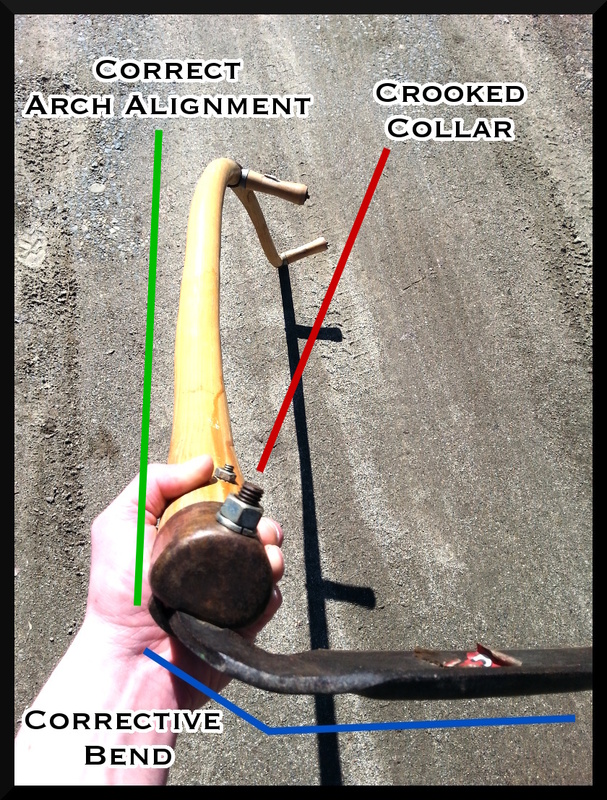 Since I am a woodworker, and love the feel of wooden handled tools..
Why not correct the collar so off the shelf blades will fit..
Well, I would take the collar off… fills the bolt holes with tight fittin’ hardwood dowels, glued in.. Shave finish away, glue on hardwood shim like a piece of White Ash..
After all that glue cured.. slap the snath in a shave horse in proper orientation and break some draw knife.. start shaving things nice and easy.. paying close attention to angle so we don’t have to do any bending of tangs..
Once it all done, holes drilled in new locations, sanded smooth.. sock the end in Pine Tar and Linseed solution fer 24 hours till the wood cannot soak anymore.. wipe off excess, let ‘er hang fer few days..
Then, put ‘er all back together.. I enjoy this site, and videos on youtube..